Recently I found some nifty little gadgets on draft blogger that you can add to your layout if you use Blogger (apparently you can tell you're on draft blogger if the little red B logo on your dashboard is blue). Actually there seem to be thousands of gadgets but I've chosen one or two to add to my sidebar just for fun. One of them is the daily Shakespeare quote, which of course makes me look frightfully clever (an illusion). Another is the Video Bar, which I've just put up. It plays your favourite You Tube snippets so you can share them with blog-chums. It seems to work OK but let me know if it doesn't. 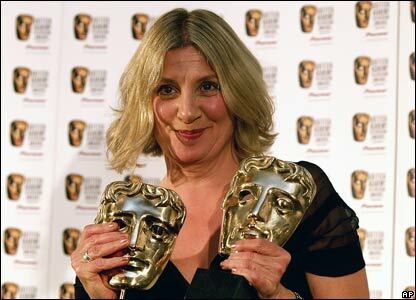 I've chosen some snippets from Victoria Wood TV shows, including the fab Freda and Barry song which never fails to double me up in stitches (in a good way). Also a spoof of a scene from an early episode of that venerable TV soap opera Coronation Street with Ena Sharples, Martha Longhurst and Minnie Caldwell sitting in the snug of the Rover's Return enjoying their milk stouts and gossip. You'd probably need to be as ancient as me to appreciate this (Corrie began in the 1960s), and hail from Northern England, preferably Manchester or Salford: "By 'eck, Ena Sharples, you weren't behind t'mangle when they 'anded out t'stair rods." I bought a sonic screwdriver* to celebrate the new series of Doctor Who which started last night and wasn't it fabulous? I'm not a big fan of Catherine Tate but she's shaping up to be a sparky partner (name of Donna) for the Doctor and promises to add a new dimension and depth to the relationship. And what about those cuddly (if repulsive when you knew what they were "made" of) monster-ettes? Genius. And next week the Doctor and Donna are in Pompeii! My cup runneth over. *Only kidding: I bought it to dismantle my oven door. On the other hand, as far as spring in England goes, our weather cup currently runneth over with rain, wind and snow. Here's a photo of our back garden this very morning. Six inches of snow and we call it April. And - well, I'll go t' foot of our stairs, as they say in The Street - here's a whole family of them, and the dog! Wow, look at that snow! We had some this morning, but it's gone from the hills now. Wasn't Doctor Who great? I loved those baby fat-monsters. :) I'm looking forward to see how Donna handles being the new assistant. Can't wait for Pompeii either!